Parenting is a twenty four hour a day, seven day a week, three hundred and sixty five day a year job. Parents do not get lunch breaks, daily ten minute breaks, bathroom breaks, holidays, paid vacation, bereavement leave, furlough days, maternity leave, disability leave, or sick leave. Much like the vows you take when getting married, parenting children is required during sickness and health. When you, as a parent, are not feeling well, it can make it more difficult than normal to keep a calm, collected presence in front of your children, especially when they are having a high needs day or are going through a tough developmental period. It is even more difficult to peacefully parent your children when you are not just sick, but in a lot of physical pain either from an injury, medical condition, or a medical procedure. What are some strategies to help parents stay centered, focused on the needs of their children, and able to continue to provide a positive, supportive parenting approach? Whatever your ailment may be, recognize your limitation as a parent and decide what sort of help you will need in getting through the day. If you have the flu and are pretty much confined to the bathroom, you NEED help parenting during that time. You are of no use to your children if you are running back and forth to the bathroom all day simultaneously trying to keep your children fed, occupied, and out of normal mischief. As a parent, you will inevitably lose your patience and your children will inevitably find themselves in a situation where your presence was required but not there. In addition, if you have very young children, you may not be there when they really need you. Have an emergency substitute parenting team in place ahead of time for those instances when you are ill, injured, experiencing physical pain, or recovering from a medical procedure. Call on your spouse/partner, immediate family, extended family, friends, and neighbors. Have certain people “on call” for certain circumstances and types of help. If you are battling a cold and need a few hours of uninterrupted sleep, a friend might be the best choice to take your children to the park to play. If you are recovering from surgery, a larger support team will be needed not only to help with the children but to help with household chores. Having a support network in place in advance will take the pressure off of scrambling around, trying to find last minute help when you are already frazzled and ready to collapse. Your children will be well taken care of and you can focus on healing yourself. You cannot be an effective parent unless your physical, mental, and emotional self is well. Try to look at the day in 15 minute increments. Focus on getting through each small part of the day instead of getting overwhelmed with the prospect of parenting your children for the next 24 hours while you are not well. Alternate each 15 minute block of time with a calm, quieter activity, followed by something more physical. For example, read your children a story while snuggled on the couch and follow that with a short trip to play outside. Again, know your limitations. Backyard play is fine. No need to head to the park. Re-prioritize your to-do list. Mom or dad needs to get better, so cleaning out the garage will have to wait for another day. Stick to basic “must do’s” like cooking and maybe laundry. The more you put on your plate as a parent, the less energy you will have for your children. What little energy you do have needs to be focused on them. 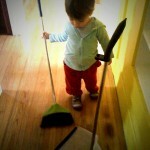 Get your child(ren) involved in any household chores that HAVE to be done. Sure it might take longer, but you are getting some help and your children are keeping busy. Be honest with your child(ren) and let them know that you are not feeling well. You can provide older children with details if they ask, but younger children just need to know that mommy’s tummy hurts, or mommy has an owie, etc. They are very in tune with their parents and will know that mommy or daddy is not his/her normal self. It is also fine to tell your children that it will be a quieter day with more indoor play, but you will do everything you can to make it fun. This way, your children feel that you still care about them and have compassion towards their daily needs. 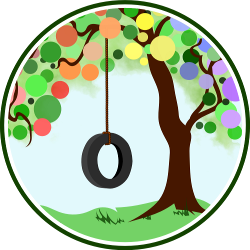 Have hands on activities for your child(ren) that give you the option of participating by lying on the floor, on the bed, on the couch, or in a chair. Coloring, board games, puzzles, play dough, clay, etc. are all activities that you can participate in but do not require physicality and exertion. If your child(ren) are old enough, provide them with a theme and ask them to create and then act out a play or puppet show for you. The creating piece will hopefully give you a bit of time to rest and you can quietly enjoy the show from the couch or bed. If you have a child over the age of seven as well as younger children, make your oldest child(ren) “mother’s helper(s)” for the day. Make them a cute paper hat or badge and decorate it. Make a big production of “crowning them” a mother’s helper. Ask your helper(s) to do as many tasks as they can handle, both physically and developmentally. Do not overwhelm or overburden them. Make it a game of sorts to keep them engaged. This will give you a much needed extra set of hands when you simply do not have the energy to get through the day. If you do lose it in front of or towards your children, be sure that you apologize sincerely and remind your child(ren) that you are not yourself. Take a deep breath, regroup, and move on. If you have a physical injury, reassure your child(ren) that you will be OK and not to worry. Make sure that they know what part of you is injured and help them understand what sorts of things might make you hurt more. You do not want your toddler stepping on your broken foot. Also, figure out alternative ways of providing physical comfort to your child(ren) as opposed to just cutting that off while you recover. If you had abdominal surgery, you may not be able to pick your child up, but instead perhaps could sit and have them crawl into your lap for a snuggle. Life happens and it is important to model a positive response to illness or injury. Your children are watching and learning how you cope with life’s blows. They are very in tune with your feelings so do not let them see you feeling guilty. Let them see you do the best that you can in your present physical state and feel confident that at the end of the day, you parented your children in the most loving, respectful manner that you could, even if it took every ounce of strength you had. And remember, tomorrow is another day, as is the day after that. Once you are recovered, you can have a special day with your children to reconnect fully and to show them that mom or dad is back in action! Jennifer, I really liked your well written blog. Could you expand it? I have a two year old, a two month old, and my husband is overseas. I am also nursing and working full time. While, I have hired a cleaning lady once a week, this doesn’t help me parent peacefully when my two year and baby are melting down at the same time. Suggestions? Hi Lisa! Let me see what else I can come up with. I am currently in the midst of a rather challenging medical issue so I do have some additional ideas. Perhaps I can post something on my blog next week…Thursdayish probably. I wll email you a link to the post as well as link it back here! Happy to help! Love the article! I would love to see more info on caring for children when one partner is ill with a chronic illness. My husband has Crohn’s disease and we have learned a lot about how to function while dealing with it. I would be happy to contribute our story as well if you were interested. We had quite a run thus far w his disease. Love this post. When I was about 4 years old, my mom was in a car accident and hurt her back quite badly. She had to be in bed for most of the day, and she was a single mom with no local family on top of it. She found a way to play with me even while stuck on her back. Her feet were one of the only parts of her that was comfortable to move, so she would pretend that they were puppies, and the puppies would play with me. I absolutely loved it. This helped us get through that trying period. A little creativity and a positive attitude go a long way!